Rilakkuma (which means relaxing bear in Japanese) is a very popular character in Japan. Omurice is omelette made with fried rice (ketchup flavored chicken rice) and usually topped with ketchup. Making Kyaraben is not that difficult. Just plan (draw picture) before you cook. Then you don't have to spend a lot of time cooking. I spent more time planning than cooking. 1. Wrap some ketchup rice in a sheet of omelette to make a pillow. 2. 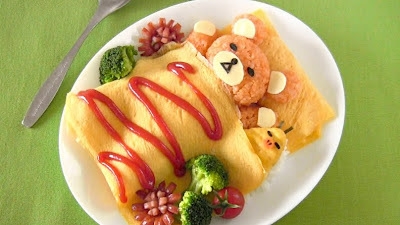 Use a plastic wrap and form the ketchup rice into the body parts of Rilakkuma. Then put together. 3. Use a chicken nugget to make a Yellow Bird (Kiiroitori). Make a beak with carrot and black sesame seeds. Make (insert) feathers using Oshaburi Kombu. Make eyes with Nori sheet. 4. Decorate the details of Rilakkuma using sliced American cheese and Nori sheet. 5. Put a sheet of omelette blanket over them. 6. Garnish with sausages, cooked broccoli, and cherry tomato. Serve with ketchup if you like.